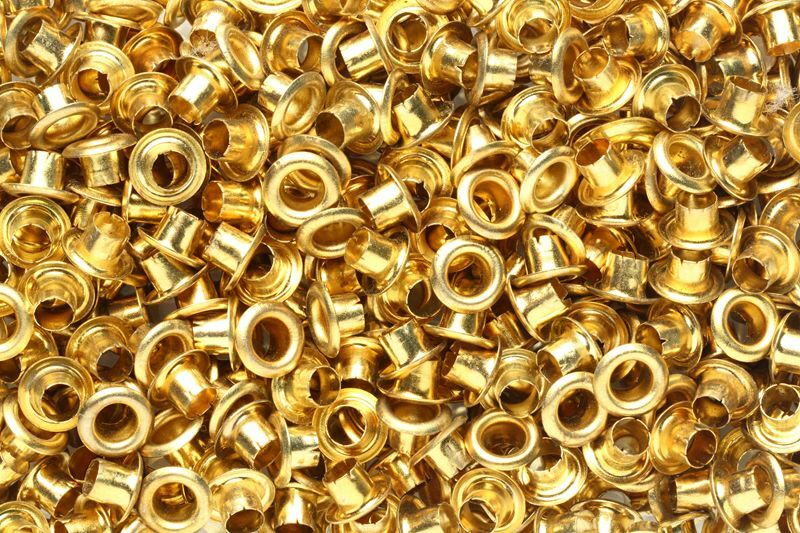 Gem Manufacturing Standard Eyelets On Gem Manufacturing Co., Inc.
Gem Manufacturing offers a full line of standard flat, roll-flange and funnel eyelets from copper and brass that can be annealed, for optimum flaring without cracking, or scored and plated in a variety of finishes. Flat Flange eyelets are recommended when a low profile or a clearance factor is required, soft materials, where a Rolled Flange could distort the surface, and recessed applications are other criteria for this style of eyelet. They are the second most popular flange for printed circuits. Prescored Eyelets for printed circuitry are prescored at equally spaced points on the barrel ID, so as to cause uniform splitting to (but not below) the printed circuit pad. They permit a unique soldering sequence as a single pass over a wave solder machine causes solder fillet to be formed on both sides of the board. Manufactured from oxygen-free, high conductivity copper, they can be supplied with any standard electroplated finish. Funnel Flange eyelets are specified principally for printed circuitry and other electronic applications. The ease of insertion of component leads, compatibility with PC board dimensions and easier soldering have established Funnel Flange eyelets as the preferred choice of electronic designers. Rolled Flange eyelets are the most commonly specified style of eyelet due to their broad range of applications. Extremely functional and noted for their tight setting, Roll Flanges are also often selected for their appearance in the final product.